В© 2012 All Rights Reserved. AcerCloud frees you to enjoy your digital life anytime, anywhere! Internet and make sure your most important files are always up to date. aerosol cleaners. Use a damp cloth for cleaning. the equipment, be sure to unplug the power cord from the electrical outlet. Install the power supply unit before connecting the power cord to the AC power outlet. Unplug the power cord before removing the power supply unit from the computer. unplugging all power cords from the power supplies. people will walk on the cord. wall outlet does not exceed the fuse rating. - Do not overload a power outlet, strip or receptacle by plugging in too many devices. strips are used, the load should not exceed 80% of the power strip's input rating. power outlet. Contact your electrician for details. properly grounded may result in electric shock and/or injury. headphones are used at high volume for prolonged periods of time. To protect your hearing, follow these instructions. - Increase the volume gradually until you can hear clearly and comfortably. - Do not increase the volume level after your ears have adjusted. - Do not listen to music at high volumes for extended periods. - Do not increase the volume to block out noisy surroundings. - Decrease the volume if you can't hear people speaking near you. - Note: Information in this section may not apply to your computer. no cards are in the slots. - Do not use this product near water. or heat register, or in a built-in installation unless proper ventilation is provided. shock. Never spill liquid of any kind onto or into the product. place the product on a vibrating surface. drive, and even exposure risk from lithium battery pack. - The bottom surface, areas around ventilation openings and AC adapter may get hot. To avoid injury, ensure they do not come in contact with your skin or body. - The power cord or plug is damaged, cut or frayed. - Liquid was spilled into the product. - The product was exposed to rain or water. - The product has been dropped or the case has been damaged. - The product exhibits a distinct change in performance, indicating a need for service. - The product does not operate normally after following the operating instructions. extensive work by a qualified technician to restore the product to normal condition. temperatures below 0В° C (32В° F) or above 40В° C (104В° F). only with the approved chargers designated for this device. might happen, for example, when you carry a spare battery in your pocket or purse. Shortcircuiting the terminals may damage the battery or the connecting object. possible. Do not dispose as household waste. 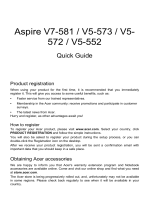 - Note: Please refer to www.acer.com for battery shipping documents. include, but are not limited to: wireless LAN (WLAN), Bluetooth and/or 3G. storage media near the device, because information stored on them may be erased. the independent research by and recommendations of Wireless Technology Research. - Not carry the device near your pacemaker when the device is switched on. If you suspect interference, switch off your device, and move it. interference occurs, consult your service provider. the operation of the aircraft, disrupt the wireless telephone network, and may be illegal. when it may cause interference or danger. - produce less heat and reduce cooling loads in warmer climates. - wake from "Sleep" mode if the keyboard is pressed or mouse is moved. - save more than 80% energy when in "Sleep" mode. ENERGY STAR and the ENERGY STAR mark are registered U.S. marks. - Numbness, or a burning or tingling sensation. - Aching, soreness or tenderness. - Pain, swelling or throbbing. - Refrain from staying too long in one fixed posture. - Avoid slouching forward and/or leaning backward. - Stand up and walk around regularly to remove the strain on your leg muscles. - Take short rests to relax your neck and shoulders. - Avoid tensing your muscles or shrugging your shoulders. of your desk to minimize neck strain. - Rest your eyes frequently. - Blink frequently to keep your eyes from drying out. - Keep your display clean. downward when looking at the middle of the display. - Avoid adjusting your display to an awkward viewing angle. - Avoid looking at bright light sources for extended periods of time. - Take short breaks regularly and often. - Perform some stretching exercises. - Breathe fresh air as often as possible. - Exercise regularly and maintain a healthy body. meeting your mobile computing needs. click Settings > Power then click Shut Down. at least two seconds before powering up. Your computer will serve you well if you take care of it. sources of heat, such as a radiator. above 50Вє C (122Вє F). вЂў Do not subject the computer to magnetic fields. вЂў Do not expose the computer to rain or moisture. вЂў Do not spill water or any liquid on the computer. вЂў Do not subject the computer to heavy shock or vibration. вЂў Do not expose the computer to dust or dirt. вЂў Never place objects on top of the computer. вЂў Do not slam the computer display when you close it. вЂў Never place the computer on uneven surfaces. вЂў Do not connect the adapter to any other device. вЂў Do not step on the power cord or place heavy objects on top of it. Carefully route the power cord and any cables away from foot traffic. should not exceed the fuse rating. before removing or replacing batteries. вЂў Do not tamper with batteries. Keep them away from children. 1. Turn off the computer and remove the battery pack. 2. Disconnect the AC adapter. 3. Use a soft, moist cloth. Do not use liquid or aerosol cleaners. 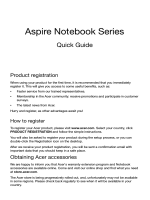 Please refer to "Frequently asked questions" on page 88.
show you around your new Acer notebook. Internal microphone for sound recording. For entering data into your computer. Web camera for video communication. Turns the computer on and off. surface to perform a left click. corner to perform a right click. Indicates the computerвЂ™s power status. Fully charged: The light is blue. Note: Push to remove/install the card. table or handle of a locked drawer. key to secure the lock. Keyless models are also available. Allows the computer to stay cool. Do not cover or obstruct the openings. Connects to an Ethernet 10/100/1000based network. (e.g., external monitor, LCD projector). вЂў USB 3.0 compatible ports are blue. вЂў Compatible with USB 3.0 and earlier devices. вЂў For optimal performance, use USB 3.0-certified devices. вЂў Defined by the USB 3.0 specification (SuperSpeed USB). Ejects the optical disk from the drive. Emergency eject computer is turned off. clip to eject the optical drive tray. Connects to an AC adapter. a suitable tool and slide to release. Houses the computer's main memory. Houses the computerвЂ™s battery pack. computers, use the lower slot in each bank. separate cursor, lock, Windows, function and special keys. The keyboard has three lock keys which you can toggle on and off. The embedded numeric keypad functions like a desktop numeric keypad. not printed on the keys. computer's controls like screen brightness and volume output. other key in the hotkey combination. backlight off to save power. Press any key to return. Turns the speakers on and off. Jump to the next media file. Pressed alone it returns to the Start screen. functions, please check Windows Help. your finger across the touchpad, the cursor will follow this movement. touch, the better the response. Please keep the touchpad and your fingers dry and clean. double tap or 'double click'. context menu related to the selected item. touchpad to select all items in an area. Note: Support for touchpad gestures depends on the active application. from the right, top or left. вЂў Swipe in from right edge: Toggle the charms. вЂў Swipe in from top edge: Toggle the app commands. вЂў Swipe in from left edge: Switch to the previous app. touchpad and moving both in any direction. documents with a simple finger-and-thumb gesture. even set these functions to automatically recur as often as your like. Manager". Alternatively, in Desktop mode, select Acer Backup Manager. of backup youвЂ™d like to create. вЂў Back Up My Files: Select files to back up. computer at a later time. computer with Acer Backup Manager. space or restore files from your backup. quicker the process will be, but it will increase your risks of losing data. remote PC, or the cloud using Microsoft SkyDrive. 3. Select how often you want Acer Backup Manager to create backups. Backup Manager cannot store a backup on the source drive. welcome screen, click Launch My Backup Profiles. From here you can edit or delete existing backup profiles. questions (see page 88) do not help, you can 'recover' your computer - i.e. return it to an earlier state. options, either using Windows tools, or the recovery backup. Note: Acer Recovery Management is only available with a preinstalled Windows operating system. and Drivers and Applications Backup and as soon as possible. Management in the list of apps. 3. Plug in the USB drive then click Next. вЂў Make sure your USB drive has enough capacity before continuing. 4. You will be shown the backup progress on the screen. 5. Follow the process until it completes. you lose or erase the USB drive, you cannot restore your computer. 7. Unplug the USB drive and label it clearly. in a safe place that you will remember. 2. Click Create Drivers and Applications Backup. have the required number of identical, blank discs. click OK. Continue until the process is complete. вЂў If you are using a USB drive, unplug the drive and label it clearly. the backup in a safe place that you will remember. see "Reinstalling drivers and applications" on page 48. For instructions on reinstalling software and drivers that were not preinstalled, see that productвЂ™s documentation or support Web site. 2. Revert to a previous system condition. 3. Reset your operating system. to its factory condition" on page 52. 4. Reset your system to its factory condition. device drivers that came pre-installed on your computer from the factory. вЂў Click Reinstall Drivers or Applications. 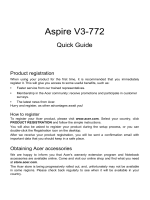 вЂў You should see the Contents section of the Acer Resource Center. this step for each item you want to reinstall. connect it to a free USB port. 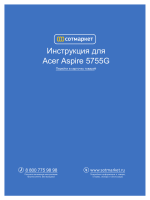 вЂў If you inserted a DVD wait for Acer Resource Center to start. Windows key + <E>, then double-click on the optical drive icon. 2. 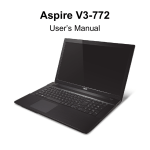 You should see the Contents section of the Acer Resource Center. each item you want to reinstall. get your system running again. also each time you install software or device drivers. the bottom of the window. 3. Click Open System Restore, then Next. correctly), click Next, then Finish. minutes, and may restart your computer. recovery backup you have created. see "Recovering from Windows" on page 53. "Recovering from a recovery backup" on page 57. Customized Restore (Refresh my PC). Store). 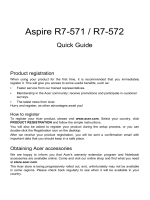 See "Customized Restore with Acer Recovery Management"
1. Click Restore Factory Settings. 2. The Reset your PC window opens. computer and takes about 30 minutes. old files are completely removed. continues by copying files to your hard drive. screen appears asking you to choose the keyboard layout. 3. Click either Refresh your PC or Reset your PC. removes all your files and resets your computer to factory settings. 1. Click Customized Restore (Retain User Data). 2. The Refresh your PC window opens. 3. Click Next, then Refresh. 1. Find your recovery backup. keyboard is attached to your computer. 3. Plug in the USB drive and turn on your computer. a. Press <F2> when starting your computer. b. Use the left or right arrow keys to select the Main menu. change this setting to Enabled. d. Use the left or right arrow keys to select the Exit menu. OK or Yes to confirm. f. Your computer will restart. allows you to select which device to start from, select the USB drive. a. Use your arrow keys to select USB Device, then press Enter. 6. Select your keyboard type. restore points to get your system running again. Caution: Reset your PC will erase all files on your hard drive. 1. The Reset your PC window opens. b. To completely restore your computer to Factory Settings, select Yes. 1. The Refresh your PC window opens. over a network (Wake on LAN). 2. Click Power Options in the Notification area. 3. Select More Power Options. 4. Select Choose what the power buttons do. 6. Scroll down and disable Turn on fast startup. The computer uses a battery pack that gives you long use between charges. with the computer turned off results in a significantly faster charge time. backup. Contact your dealer for details on ordering a spare battery pack. the computer turned off results in a significantly faster charge time. Note: You are advised to charge the battery before retiring for the day. the next day with a fully charged battery. 1. Insert the new battery without turning the computer on. 2. Connect the AC adapter and fully charge the battery. 3. Disconnect the AC adapter. 4. Turn on the computer and operate using battery power. 5. Fully deplete the battery until the battery-low warning appears. 6. Reconnect the AC adapter and fully charge the battery again. two weeks, you are advised to remove the battery pack from the unit. adversely affect the battery pack. shorten the effective lifespan of the battery. battery pack after it is fully charged. prolonging the charge/recharge cycle and improving recharging efficiency. вЂў Purchase an extra battery pack. вЂў Use AC power whenever possible, reserving battery for mobile use. they can continue to draw power. cause the battery to self-discharge faster. вЂў Excessive recharging decreases the battery life. вЂў Look after your AC adapter and battery. battery/power icon on the taskbar to see the battery's present charge level. When using battery power pay attention to the power meter. allowed to become fully depleted and the computer shuts down. connect to the main power supply. 2. Save all necessary files. 1. Save all necessary files. 3. Turn off the computer. pack is available. 4. Replace the battery pack. 5. Turn on the computer and resume work. the AC adapter if you want to continue using your computer. Otherwise, turn off the computer first. contacts will enter first, and that the top surface of the battery is facing up. 1. Slide the battery release latch to release the battery. 2. Pull the battery from the battery bay. 1. Save any open files. 2. Remove discs from optical drive(s). 4. Close the display cover. 5. Disconnect the cord from the AC adapter. office desk to a meeting room. display; then press and release the power button. being in Sleep mode for a period of time. adapter with you to plug in your computer in the meeting room. close the display cover whenever you are not actively using the computer. When you are moving from your office to your home or vice versa. drive(s). Failure to remove the media can damage the drive head. from sliding around and cushion it if it should fall. computer. Pressure against the top cover can damage the screen. вЂў AC adapter and power cord. вЂў The printed setup poster. exposing the computer to excessive heat. environment with a temperature between outside and room temperature. adapter, you can avoid carrying the extra weight to and from home. also want to add an external keyboard, monitor or mouse. office building to a client's office building or traveling locally. on your computer when carrying it into the gate area. вЂў Always take the computer as carry-on luggage. machines are safe, but do not put the computer through a metal detector. When you are moving from country to country. Prepare the computer as you would normally prepare it for traveling. вЂў Spare, fully-charged battery packs. вЂў Additional printer driver files if you plan to use another printer. вЂў Proof of purchase, in case you need to show it to customs officials. вЂў International Travelers Warranty passport. not use converter kits sold for appliances to power the computer. Your computer is a valuable investment that you need to take care of. Learn how to protect and take care of your computer. the key to secure the lock. Some keyless models are also available. 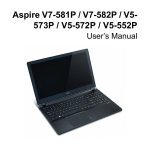 вЂў Supervisor Password prevents unauthorized entry into the BIOS utility. utility. See "BIOS utility" on page 87.
вЂў User Password secures your computer against unauthorized use. Combine the use of this password with password checkpoints on bootup and resume from Hibernation (if available) for maximum security. вЂў Password on Boot secures your computer against unauthorized use. appears. Try again and press <Enter>. enabled, a prompt appears at boot-up. Your computer's wireless connection is turned on by default. Windows will detect and display a list of available networks during setup. Select your network and enter the password if required. Otherwise, open Internet Explorer and follow the instructions. Please refer to your ISP or router documentation. What are benefits of a wireless network? Also you can share an internet connection with other computers in your home. need to pull cables through walls and ceilings. with your Access point/router for detailed setup instructions. 1. Bluetooth is enabled on both devices. 2. Your devices are "paired" (or connected). turn on its Bluetooth adapter. 1. Press the Windows key + <W> and then type Wireless. 2. In the results, click on Wireless. 3. Click the toggle under Bluetooth to enable/disable it. adapter. This means it must first be authenticated for security purposes. adapter of both devices will connect them. Click on the device you want to add. Your device will show up in the list of devices if it was successfully paired. Operations > Connect to operation window. peripherals without taking up system resources. problems, you may need to run it. computer logo is being displayed. select Boot from the categories listed at the top of the screen. boot: and use the <F5> and <F6> keys to enable this feature. of your computer. Easy solutions are provided for each one. computer. Connect the AC adapter to recharge the battery pack. and to the power outlet. <Del> to restart the system. screen to save power. Press any key to turn the display back on. release the power button to resume. deselect the Mute all option. keyboard cable may be loose. and the corresponding port on the printer. network of service centers are there to give you a helping hand. service centers is in this handy booklet. Read this passport thoroughly. receive the benefits from our support centers. Place your proof-ofpurchase in the flap located inside the front cover of the ITW passport. number and sequence in the case of beeps). to, so we've created a few pointers to help you get started. Live tiles are similar to thumbnails of the apps. turning off your PC or changing settings. How do I access the charms? access the charms, or press the Windows key + <C>. How do I jump between apps? apps that are currently running. Button and select the action you'd like to take. Why is there a new interface? The new interface for Windows 8 is designed to work well with touch input. displayed on Start using live-tiles. you can view weather or stock updates without needing to open the app. How do I unlock my computer? How do I personalize my computer? arranging the tiles to suit your personal needs. top of the page and select a color and image. How do I move tiles? Can I make tiles bigger or smaller? quick status and notifications to suit your personal needs. So, how do I close an app? downwards to close the app. screen by right-clicking on a thumbnail and selecting Close. Can I change the screen resolution? results; click Control Panel > Adjust screen resolution. apps you frequently use to the taskbar to easily open them. automatically open the app using Desktop. and Search will automatically open and list results. How do I make an app appear on Start? How do I remove a tile from Start? How do I make an app appear on my taskbar in Desktop? taskbar from the menu that appears at the bottom of the screen. a Microsoft ID to purchase and download apps from Store. I can't find apps like Notepad and Paint! Where are they? scroll to вЂ™Windows AccessoriesвЂ™ to see the list of legacy programs. What is a Microsoft ID (account)? How do I add a favorite to Internet Explorer? the page to open the menu at the bottom of the screen. Click Pin to Start. How do I check for Windows updates? > Windows Updates. Click Check for updates now. This chapter shows you how to deal with common system problems. error message reports to help you solve problems. dealer. See "Requesting service" on page 90.
together with the recommended course of action. - Consult the dealer or an experienced radio/television technician for help. maintain compliance with FCC regulations. peripherals is likely to result in interference to radio and TV reception. Commission, to operate this computer. Cet appareil numГ©rique de la classe B est conforme a la norme NMB-003 du Canada. on the recorded image and does not constitute a malfunction. Bluetooth modules). Below information is for products with such devices. and other relevant provisions of Directive 1999/5/EC. Note: Channels 10 through 13 inclusive operate in the band 2446.6 MHz to 2483.5 MHz. of Defense, with maximum authorized power of 100 mW in the 2446.5 - 2483.5 MHz band. Use outdoors on public property is not permitted. in more areas within France. Please check with ART for the latest information (www.art-telecom.fr). Note: Your WLAN Card transmits less than 100 mW, but more than 10 mW. Health Canada's website at www.hc-sc.gc.ca/rpb. This device complies with RSS210 of Industry Canada. No 4 (Dec 2000) and No 5 (Nov 2001). its transmit antenna) that is installed outdoors is subject to licensing." Cet appareil numГ©rique de la classe B est conforme Г la norme NMB-003, No. 4, et CNR210, No 4 (Dec 2000) et No 5 (Nov 2001). un Г©cran de blindage maximal. Si le matГ©riel (ou son antenne d'Г©mission) est installГ© Г l'extГ©rieur, il doit faire l'objet d'une licence. or damage to this device. with the E.I.R.P limit for the 5.25- to 5.35 and 5.725 to 5.85 GHz frequency range in pointto-point operation. that are included in the user's manual of each RF option device. implements a transmission diversity function. manually (by users) to ensure good quality radiocommunication.